Okay, I admit it: I LOVE exploring castles. This includes walking around ancient ruins, seeing majestic old buildings from afar, and especially being able to peek inside over-the-top glamorous rooms used long ago by generations of royals, such as the beautiful Schönbrunn and Hofburg Palaces in Vienna, Austria that I wrote about previously. 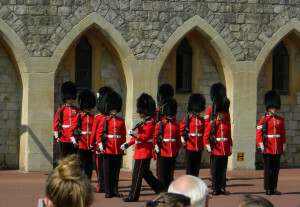 But during my trip to London earlier this summer I was able to tour something different – a real working palace. In fact, Windsor Castle is still very much in use today as it employs hundreds of workers. The castle was originally built in the 11th century and has been at least a part-time residence for all of England’s monarchs since Henry I. 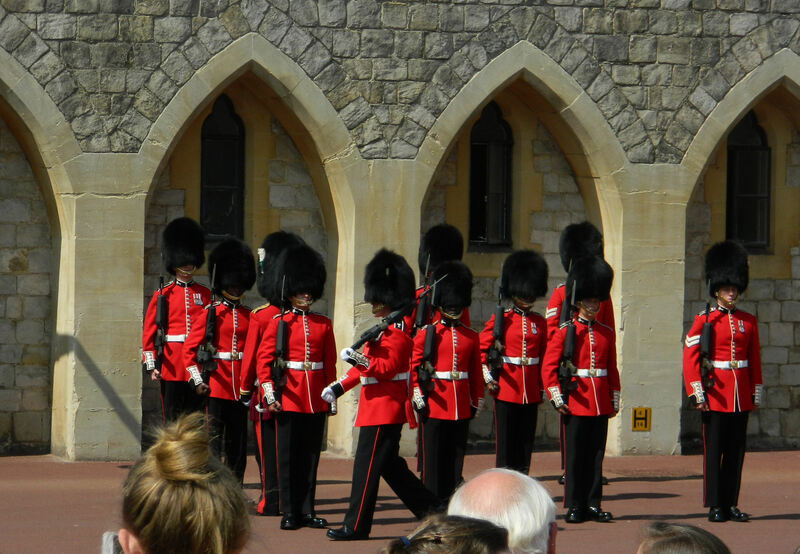 It is also where Queen Elizabeth spends most weekends. NOTE: You can tell if she’s currently on property by looking at the flag that is flying. The Royal Standard flag means she’s there and a Union Jack flying means she’s left the grounds. During a day-long bus tour to several areas outside of London, we had a stopover at Windsor Castle, including entry into the State Apartments and ceremonial rooms. And I’m happy to report that the Royal Standard flag was flying while we were there on a Monday morning – but the Queen never did come by to say hi. It’s a “longish” but quite charming walk from the parking lot, up to and through Windsor Old Town, and then on to the castle’s Admission Center. I loved my first far-off view of the timeless spires and rounded towers, and my excitement grew the closer I got. This is the type of castle my King Arthur/Guinevere/Lancelot-loving heart has always dreamed about! This used to be where the moat was located! Walking around and inside the castle grounds was awe-inspiring. But I was even more excited to get inside, which turned out to be a LOT of rooms open for viewing. But two, which are still used today, made the biggest impressions. First, the Grand Reception Room is made up of gilded gold furniture, huge tapestries, big and bright windows, and soaring ceilings topped with intricate gold paneling. Go to the Royals website and click on “Related Images” to see this beauty in all its glory. This is when I was REALLY sad that visitors are not allowed to take interior photos! My other favorite was the long, 185-foot, runway-like St. George’s Hall. While we were there, the red carpet in the middle of this majestic reception room was empty, with chairs set here and there along the walls. However, during incredibly fancy state dinners and banquets, one verrrrrrry long table is set for up to 160 guests in the room’s center. This is shown really well in the video clip below. 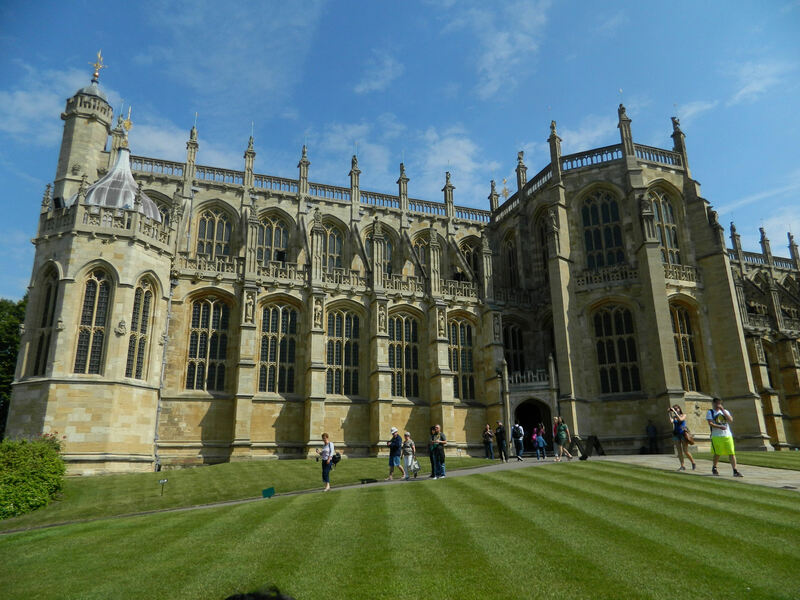 After wandering around the various rooms while listening to a hand-held audio guide, I decided to check out the very beautiful St. George’s Chapel, which is located on the grounds. 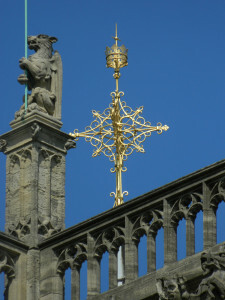 Built in the 15th century, the chapel houses the remains of Henry VIII, Jane Seymour, and Charles I. Stepping outside the chapel, I was pleasantly surprised to see that I was just in time for the Changing of the Guard, which happens right next door. This 30-minute ritual is very interesting and well worth seeing. It ended up that the bus waited for us, but I really wish we’d been allowed more time there. I didn’t get a chance to see Queen Mary’s Doll House (a miniature replica so prestigious it even has a version of the crown jewels!) or any of the Royal Collection art exhibits in the Drawings Gallery. 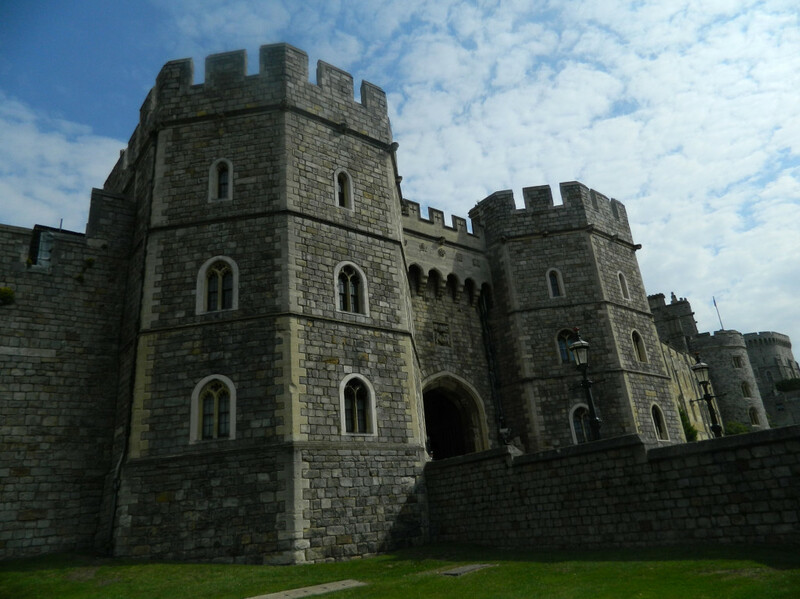 And I would have liked to have had the chance to explore and eat at Windsor town. Next time? I’ll just take a train from London. It’s only about 30 minutes away and there’s a station right at the village. In other words, I’m looking forward to once again being a guest in the Queen’s weekend home! Would love to have been with you. Sounds like an awesome place to see. Your pictures are really fantastic, and the write up is absolutely wonderful. Great job Deborah! Thanks Darlene! I had no idea this was going to be so spectacular. 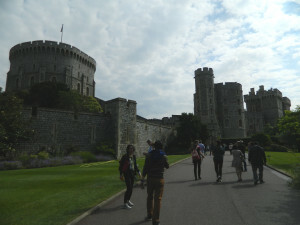 Next time I’m going to leave open the whole day for exploring the castle, its grounds, and the surrounding area! I absolutely love castles. I can’t get enough of them. And to tour one that Royalty actually lives in would be fantastic. Great article, great pictures. By the way, did you see a dungeon? Ha! No dungeon but I did see where the moat used to be. So the dungeon was probably close by. Thanks for stopping by and for the nice comments! We love castles too! 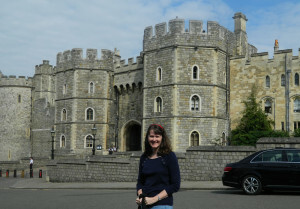 We did not make it to Windsor, but we did love exploring Warwick castle not too far from London. Other great castles are Carcassone in the south of France and Frederiksborg Palace outside of Copenhagen (which I guess is technically a palace/castle?). I could spend years exploring the castles of the world! Oooh, thanks for the suggestions of other castles Kirsten. I’m adding them to my “someday” list! I’ll be traveling to Berlin this Fall, so already have a bunch of castles to check out around the area (especially in nearby Potsdam). Deborah what a wonderful way you have of writing about your travels! Makes us all feel that we were there with you. I love everything that resembles a castle – just to imagine what life was like. Not great for everyone I imagine but challenging and fun to think about. Thanks for a fun post! I love castles too! I remember visiting my first and how it struck me that it was *real* and not some Cinderella’s castle at Disney world. All that history standing there! 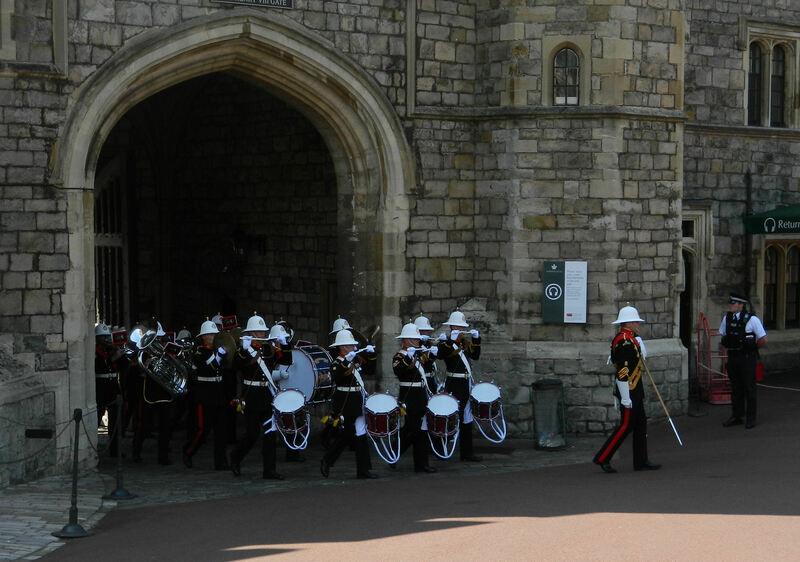 I haven’t been to Windsor, but it looks fantastic! 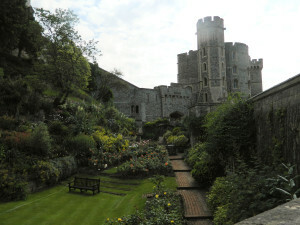 I find it especially interesting that they converted the moat to gardens. You know Sarah, I never thought about it before but my first love of castles also came from Disney! And then I saw parts of a fake one on some Universal movie set. So seeing actual ones that have been standing for so long and played such a part in history has been wonderful. I just love ‘em! Castles are so neat! Of course they aren’t wheelchair friendly with being built centuries ago and all! I’d be interested to hear how different castles from various countries/cultures are from each other. Oooh, that would be fun story to write up Jamie. One that compares castles across a number of countries. Hmmm, I’ll let you know if I manage to sell that one! Interesting point about wheelchair accessibility. 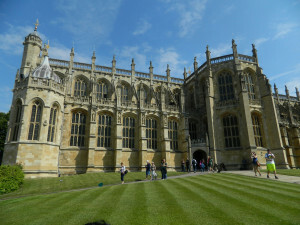 Windsor Castle is not but both the Schönbrunn and Hofburg Palaces in Vienna, that I wrote about before, are.